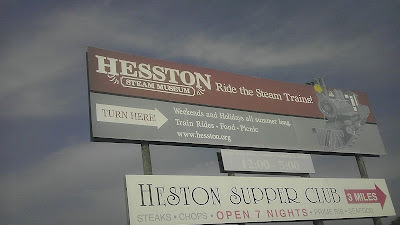 Not too long ago we loaded up the kids and took a small trip to the Hesston Steam Museum. There you will get to see and ride on old steam trains. Here they got to see more than just trains. They got to see a real working saw mill, and got to blow the train whistle. 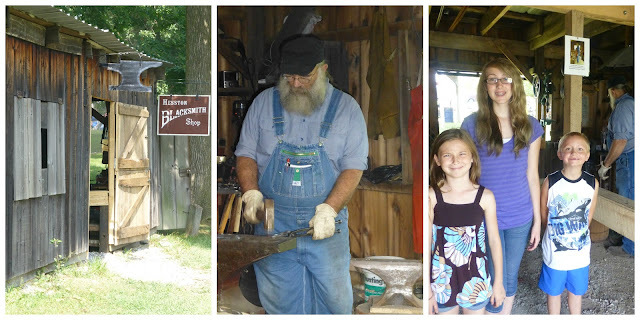 There was even a real life blacksmith on hand. We were there for hours riding the trains and enjoying the sights. 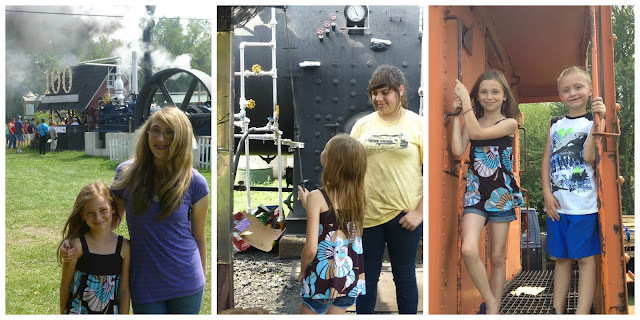 Admission to get into the steam museum was only $5 for adults, and free for children under 12. 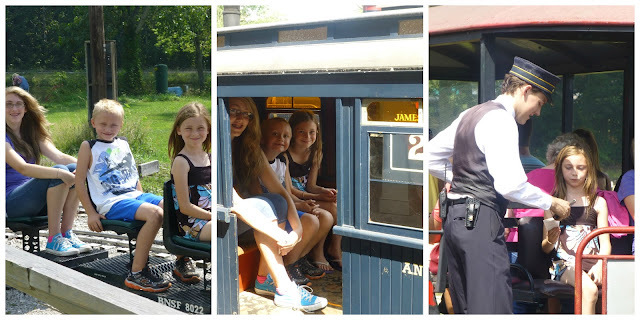 The train rides did cost extra, at around $3 a ride for children and $5 per adult. We plan on going back at Halloween for their haunted train ride (suitable for all ages) as well as at Christmas for a train ride with Santa! The Hesston Steam Museum is located at 1201 E 1000 N, La Porte, IN. Do you have any old train stations near you? Cool vintage train station place. We have some kinda of little train museum here but I've never been. Living history places like that are the best way to enjoy it! That's awesome. We do have a place like this near us. It's called Edaville Railroad, but it's not open year round. They open up in the summer and in December for Christmas time at night. They light up the whole park and you can ride the train and see all the decorations as you go. Besides the train, they put in some small amusement rides and they have a cool train museum there. This one isn't open year round either. I think they close soon, but will reopen for the two holiday weekends for the special events there. No I don't have one..I really want to visit such a lovely place..
Ohh, I would go there in a heartbeat for Halloween and the ride w/Santa. I love the old steam trains! Oh wow look at all these locomotives. I would love to go there! Wonderful pics. sounds like you have a good plan for the Halloween! Definitely! You know how I love Halloween. I am so excited to see how they decorate the woods that the trains travel through for the holiday! :) pretty neat. We have a good railway museum in Delhi. What a fun day. I always enjoy a ride on a train. We have a place not far from us that offers train rides and they even have a Santa one as well. It must have been so interesting being there Theresa! Lovely shots! I have never been on a train. Unfortunately Jamaica no longer has a railway system. It was restarted a few years ago and then stopped again. That's too bad Judy! I think everyone should get to ride a train at least once. And hear the whistles blow too! I love these great photos, wonderful steam locomotives! Ya, there is a cool old train that travels along a reservoir between neighboring counties. It is the Heber Creeper. It starts in the town of Heber. (hee-bur) It travels the path at Christmas time under the pseudo name of "The Polar Express". I have been on it twice and it is kind of too slow, but it does have a certain romance and charm about it. Well, it does sound slow, with the name "creeper" in there lol. Then again, I bet it appeals to the older folk who ride the trains to enjoy the scenery, not for how fast they travel. My boys would love that!!! We have the a museum for old trains here called the Durham Western Heritage Museum. You can't get in a train and ride it. It's old trains that are in a building. People can get on them. OK, that is COOL! I especially like the tiny steam train. If Memphis has anything like that I haven't seen it. But now that you've mentioned it I may have to go looking. That is so awesome. I hope you take pics at Halloween!...and Christmas too. That looks like a museum I'd love to visit. I bet the kids enjoyed that. sounds like to take a lot of day trips, that's really awesome for the kids.